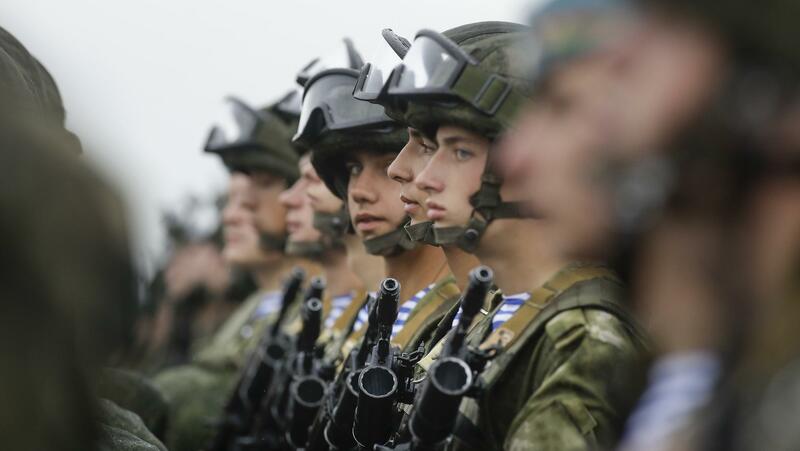 Russian troops and their Belarusian counterparts await orders during joint military exercises in Belarus last year. Next month, Russia will embark on another joint military exercise — this time on a much larger scale and in collaboration with China and Mongolia. Amid mounting acrimony with NATO, Russia's military has announced plans to hold its "biggest exercises since 1981." The country's defense ministry says the massive exercise next month will involve some 300,000 Russian troops, more than 1,000 aircraft and the participation of some Chinese and Mongolian military units. The military drills, known as Vostok-2018 or East-2018, are expected to commence Sept. 11 and last five days near Russia's eastern border. The vast scale nearly doubles another recent Vostok exercise, which Russia held just months after its 2014 annexation of Crimea — and which at the time, Russian President Vladimir Putin had hailed as "the largest exercises of this kind that we have ever held." Speaking with Russian media on Tuesday, Defense Minister Sergei Shoigu likened September's upcoming military exercise to an event buried much further in the past — back to an era when the Cold War was flaring hot. "In some ways, they resemble the Zapad-81 drills," Shoigu said, referring to the West-81 exercise that the Soviet Union held not long after President Ronald Reagan's first inauguration. "But in other ways," he added, "they are, perhaps, even larger." Back in 1981, the Soviets were mired in their own rocky invasion of Afghanistan and confronted with the hard-line rhetoric of the new American president. These days, the U.S. is the country with troops in Afghanistan — but Washington, its NATO allies and the Kremlin are once more embroiled in escalating hostility. That includes the sanctions leveled against Russian entities for interference in the 2016 U.S. presidential election, a nerve attack on a former Russian spy and the country's interventions in Ukraine. As relations between Russia and the West have grown increasingly rancorous, with diplomats on either side expelled in waves in recent months, Russia's neighbors in the Baltic region have grown increasingly wary. Sweden, for one, has distributed pamphlets detailing what to do "if war comes," and last year, the country's armed forces joined NATO powers in their own large collaborative military exercise. Now, nearly a year after that operation — and nearly a year after the latest iteration of its own regular Zapad exercises — Russia is hailing the approach of more war games. "Imagine that 36,000 pieces of hardware are operating simultaneously — tanks, armored personnel carriers, infantry fighting vehicles," Shoigu said in a statement Tuesday, "and all of them are tests in environment closely resembling a combat one." In comments to Russian media, Kremlin spokesman Dmitry Peskov explained the need for such vast drills by pointing to this "international situation, which is frequently quite aggressive and unfriendly for our country." In fact, he said, the exercise is "justified, needed and has no alternative." And it gestures toward a warmer relationship with China, which has upped its military budget amid rising tensions of its own with its neighbors and the West. According to Russian media, Beijing plans to send more than 3,000 of its troops to participate in the drills. "This speaks about the expansion of interaction of the two allies in all the spheres," Peskov added. "All nations have the right to exercise their armed forces, but it is essential that this is done in a transparent and predictable manner," NATO spokesman Dylan White cautioned in a statement to the BBC. "Vostok demonstrates Russia's focus on exercising large-scale conflict," he added. "It fits into a pattern we have seen over some time: a more assertive Russia, significantly increasing its defence budget and its military presence."